Do solar panels work even when there’s no direct sunlight? Try asking Germany, which produces 6.5 times more solar energy than the U.S., despite spending most of its year in overcast (a little over two months of sunlight a year). Now, Andrew Curry of Slate Magazine reports that Germany produces enough renewable energy to sustain 22 percent of its energy needs, a quarter of which is solar power. The further solar power technology advances, the more affordable solar panels get. 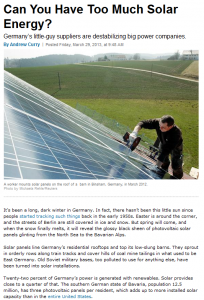 So why is Germany, a really cloudy country, the current world leader in solar energy? If you’ll look at Germany in solar irradiance maps, you can see that much of the country doesn’t get as much sunlight as the entire United States. Apparently, most people think that solar panels won’t work under cloudy weather since the clouds are blocking precious sunlight. As it turns out, it’s one of the biggest myths surrounding solar roofing in Danville, CA and the rest of the world. Solar panels actually perform better when the mercury drops than when it rises. Residents with solar roofs in cold climes claim that the maximum wattage their panels produce is 25 percent higher than that produced by panels in warm places like California. Temperature plays a critical role not in how much sunlight the panels absorb but how much they convert into energy. Scientists argue that the effects are generally minimal, but energy loss is still a loss. Last May, the report states that Germany managed to produce solar energy the equivalent of roughly a third of that produced by nuclear plants in the U.S. The market for solar energy is competitive to the point that it has power companies rethinking about their plans for future plants. Of course, the market isn’t without its problems; it needs to generate more solar energy. Even for environmentalists, subsidy for solar energy just to sustain a fifth of the country’s energy needs is anything but promising. It will have to pick up the pace; the aftermath of the Fukushima disaster in 2011 convinced Germany to abolish nuclear energy by 2023. Sustainable sources such as the Sun will need to play an even bigger role in Germany’s energy requirements. Everywhere you go, you’re almost certain to find solar panels in residential rooftops, roofs of barns, along train tracks, and even in what used to be military bases in the eastern half. California is no Germany; but given that it benefits from solar energy, the Golden State can learn from the world’s leading solar energy producer. At least now you know that solar panels can work just about anywhere, rain or shine. Get a licensed Danville roofing contractor like RoofMax to discuss about how your home can benefit from solar energy. This entry was posted in Blog, Facts & Guides, Solar Roofing. Bookmark the permalink.